Following on my the previous post: autorickshaws are not just convenient modes of transport – they are also extremely fertile grounds for research (and ‘research’) and design (of fun afternoons). I make as many weekend trips from work as possible. The weekend before Dehradun, I was in Jaipur, Rajhastan. My friend and I walked out of the train station early in the morning. Naturally, a swarm of rickshaw-wallahs offered us transportation, some forcefully. Talking to one driver, we made the condition that we would only go with him if he let us drive. He agreed. Wearing sunglasses with a video camera embedded between the eyes, we went for a spin. We also asked Don, our driver, to survey his path while wearing the equipment. As far as mobile phone communications are concerned, there was some of that as well. Once the video is edited, Derek (pictured, right) will have a clip of us exchanging numbers with Don, who became our private transport and part-time guide that weekend. Even Harshad, a friend from New Delhi who lives in Jaipur, was eager to take Don’s phone number. This proved to be a wise move, because Don called saying he had found a wallet on the seat. He delivered it the next day, and we went to do more ‘field work’. Fritjof Capra, author of “The Web of Life” and, more famously, “The Tao of Physics”, gave a course Feb. 22-24 in Dehradun, Uttranchal State, India. It explored the dimensions of a new, emerging sustainability science based on ecological design… but I won’t go too deep into that here. The site chosen was Navdanya, and organic ‘conservation’ farm that functions as a living seed bank – that is, the crops are not locked away, but actively cultivated. Vandana Shiva named the many pure varieties we ate for breakfast, lunch, and dinner (incidentally, Carlo Petrini was among the 30-odd participants as well). So, if you ever get your hands on amaranth, I recommend you sautÃ© it and fold it with honey. But I digress. The sweetest part of the course was the bike ride through the neighboring villages I took during our afternoon siesta. I could not sleep or chat or read, and there was a clunker of a bike with my name on it. I made friends with Babalu, the go-to-guy on the farm with all the keys, and I rolled down to the ‘main road’ for a long ride. A 600 litre water tank on wheels (portable but not potable) with a tropical sunset scene done in acrylics that graced the front. A cellphone icon and not 1 but 2 cellular numbers were painted on as well. One boy biking on the other side of the street whistled, “Hallo,” which is not uncommon, except he was talking into an microphone wire on his red-dirt shirt. The rental wedding band taking a break by the side of the road. Their marching band attire includes large red ankle bands and vests, on which the cellular number for the dispatcher was embroidered in gold thread. Mechanics using mobile phones with white LED lights embedded in the front to see into a motorcycle engine. The Nokia 1100 and 1200 models, which have these mini-flashlights built in, are among the most popular model of phone sold in India and Africa, I’ve been told. My friend uses one to manuever his keys in his front door at night. Many people sitting around, drinking tea, walking, biking, etc. while holding their mobile phone as it plays loud Hindustani music from a non-toll-free number. It goes without saying that the course was excellent, enjoyable, enriching, etc., but it was all very abstract – Dr. Capra is a systems theorist and physicist by training. What was much more apparent was how low-cost mobile phones are facilitating a different, digital web of life. The implications for ‘sustainability’ are large though hard to define from a cursory village cruise on a bike, but are certainly food for thought. * This deserves an elaboration: the strategy of calling someone fluent in Hindi at or near your destination has been the salvation of many an expatriate, myself included. Often, the driver or you will have to figure out the route by landmarks. If you are lucky, a shopkeeper or passerby in the neighborhood can direct you once you get close. 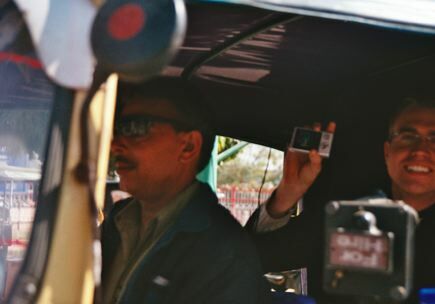 But – if you and the driver are lost, or you can’t remember the name of this or that street, temple, etc., or your rudimentary Hindi is inadequate for describing the particular location, a mobile phone can leapfrog these problems, saving time, money, and frustration. Another patent, obtained in 2003 by NCR Corp., details how camouflaged sensors and cameras would record customers’ wanderings through a store, film their facial expressions at displays, and time â€” to the second â€” how long shoppers hold and study items. Scary stuff since all it does is make us fear for our personal privacy without a sense of proportion or possible recourse. Still the reporter does a good job reporting on the history of RFIDs and their broad applicability. Environmental implications are vast (e.g., how exactly do you safely dispose of nanotech?) but the technology is sooo cool. You are currently browsing the Computers, Society, and Nature blog archives for February, 2008.